1. By being employed (officially) in Spain and paying Spanish national insurance contributions. Dependants of the employed person are also covered. ** See below re change in law. 2. Persons of pensionable age will be covered by forms issued by the Department of Work and Pensions in the UK. These forms have to be registered with the INSS (Instituto Nacional de Seguridad Social), then persons are registered in the Spanish system. 3. Persons receiving incapacity benefit or some other benefits from the UK may be entitled to register for treatment in Spain. Contact the DWP in Newcastle to check out for your own individual circumstances. ** UPDATE 2018: Very good news for anyone living in Spain is that healthcare is now available free of charge to everyone. Even illegal immigrants, even UK expats after Brexit! Enjoy that, courtesy of Pedro Sanchez and his PSOE government. 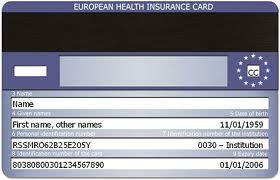 For holidaymakers, don’t forget your EHIC card. Finally, if for some reason you cannot get entitlement, then consider private health insurance, with a company such as Sanitas. If you'd like to thank me or read testimonies click here and order that thing you've been considering on Amazon. It helps to pay for my web hosting and doesn't cost you a penny extra. Thank you!